More denier weirdness @wattsupwiththat - How much CO2 have we put in the air? ...when questioned about how much CO2 is in our atmosphere most people give me a guess of somewhere between 30% and 70%. When I tell them that CO2 is only 0.04% or really about 395 ppm (parts per million) they generally look at me as if I was speaking some kind of foreign language. There would be a lot of people who don't know how much carbon dioxide is in the air. We who inhabit the blogosphere can easily overestimate the level of climate knowledge in the general populace. Science education is pretty poor in some school systems. Even where it's done well, lots of people would have no use for the information. So even if they once learnt about the air we breathe, they've probably forgotten what they were taught. However, we who inhabit the climate blogosphere don't make the mistake of overestimating the level of climate knowledge at WUWT, that boasts (incorrectly I'd say) of being "The world's most viewed site on global warming and climate change". That blog is known for posting utter nuttery on global warming and climate change and today's article is no exception. Ryan Scott Welch started off with an analogy that he felt suited his acquaintances and the readers of WUWT. He suggested people think of The Dallas Cowboys Stadium, which he said seats 100,000 for special events. (I'll skip over the obvious that nitrogen, oxygen and argon between them take up almost all of the seats, provided you are talking about dry air.) He said that if all the molecules in the air were represented by the 100,000 seats then CO2 would comprise 40 of those seats. So far so good. Then he said that before industrialisation, 25 seats would have been occupied by CO2 but that now that's risen to 40 seats. Again, so far so good. And since humans only contribute 3% of all CO2 emitted into the atmosphere each year (97% is from nature), the human contribution is 3% of the 15 remaining seats in our sample. 3% of 15 is 0.45. Now that's a good example of arithmetic failure and scientific failure. The arithmetic failure is obvious. Ryan wrote humans contribute 3% of all CO2 emitted into the atmosphere each year, but then decided to use that number as the total human contribution over all the years. And, of course, Ryan's 15 extra seats are only occupied by CO2 because human activity has increased atmospheric CO2 by 40%. The half-seat analogy is selling something, not a fair appraisal. The real question is, of the fifteen seats, how much of the are human produced CO_2 that has hung around from the half-seat contributed PER YEAR. That would be all of it, so the presentation should have stopped at 15 seats. A second objection is that this has nothing to do with whether or not the first 25 seats are an important component of the overall GHE, or whether or not the addition of 15 more seats produces a measurable, possibly significant, increase in greenhouse trapping of heat. It’s all about helping people to visualize small numbers which is just fine but obscures the simple fact that the GHE is real and that the 0.04% atmospheric concentration contributes a lot more than 0.04% of it. Sure, it isn’t as important overall as water vapor, but water vapor is highly variable and CO_2 is more or less well-mixed and hence provides a widespread and consistent base to the overall GHE. HW readers know rgbatduke is not usually quite as canny and has written some very silly things in the past. So it's comforting to know (because he teaches undergrad physics at Duke) that he's not completely ignorant about the atmosphere. I was about to go an on rant, but RGB beat me to it. Second, I don’t see the point of the analogy. Your argument seems to be, CO2 is only a trivially small part of the atmosphere, so we can ignore it. ...Thanks for an interesting post, however, well written, good graphics. For the reasons RGBATDUKE outline above (which I wholeheartedly concur with), WUWT should this take down completely or in a comment from Andrew, WUWT should strongly distance itself from this piece by Welch. Once Welch introduced the time factor (CO2 per year) into his argument, he was lost. Except that's not correct either, is it. We've been adding 0.45 of a seat a year? Divide the 15 extra "seats" by 0.45 and you'd conclude that we have only been adding CO2 to the atmosphere in the past 33 years. That is, since 1980. It’s not Argon that is 0.9% of the atmosphere, its water (H2O) that is around 1%. And here are some of Ryan's own responses. He's not shy about demonstrating his ignorance and I bet he's thrilled to bits to get his article published on the world's most visited anti-science blog. I don’t think the human contribtion to CO2 is .5 seats per year. According to the Mauna Loa record, atmospheric CO2 rose from 394.28 ppm in December 2012, to 396.81 ppm in December 2013, and increase of 2.53 ppm in a year. If the human contribibution was to atmospheric CO2 is 3% of the yearly output, then 3% of 2.53 ppm is 0.0759 ppm. Ryan's obviously not aware that for thousands of years CO2 was pretty much in balance with only a small addition from human activities until we started burning vast amounts of fossil fuels. He's got stuck on his magic number of 3%. He doesn't say where he got this number from but I think it's now getting closer to 4% of the total annual exchange between the atmosphere and the surface. Also, he's multiplying the 3% with the wrong number. 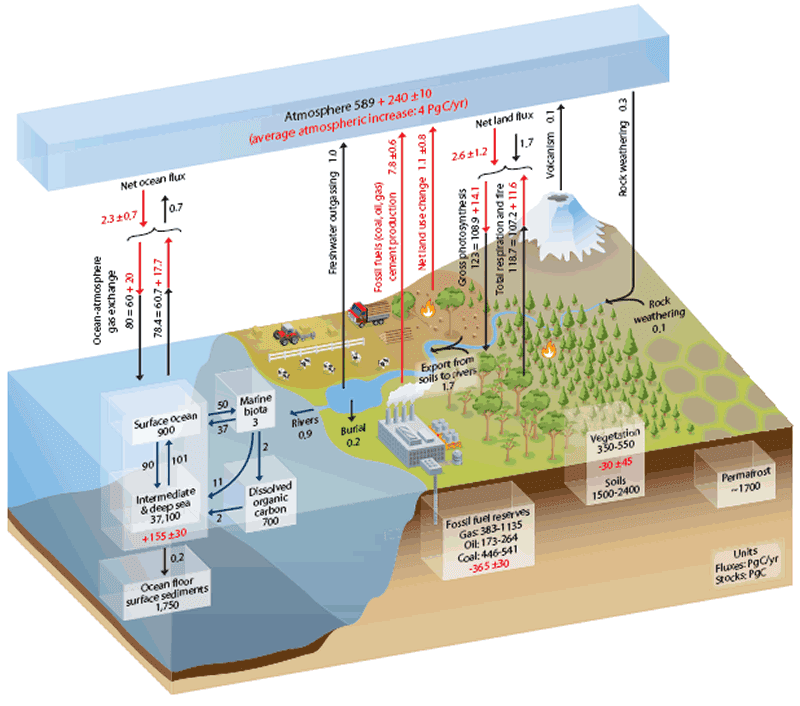 In fact the additional CO2 from human activity is more than double his 2.53 ppm, 55% of emissions are being absorbed by the oceans and biosphere. There's a chart in the IPCC AR5 report, but it's complicated and I don't have time to work out all the pluses and minuses or percentages. Here it is - with descriptive text on page 6-8 of the full report (click to enlarge). I submit that most of the rise in atmospheric CO2 is from oceanic outgassing as the earth has warmed from the last Ice Age and the LIA. As the eath warms CO2 rises regardless of any human factor. If earth was warming naturally and humans weren't adding CO2 to the air, then yes, the oceans would release CO2 as they got hotter. However, we've added so much CO2 that the oceans are a net sink not a net source right now. Oceans are absorbing something like 30% of all the extra CO2 we're adding to the air and another 25% or so is being taken up by plants etc. we know we're emitting twice as much CO_2 than would be cause the observed increase in atmospheric concentration. the only possible conclusion: it's all due to oceanic outgassing, and smoke-stacks and exhaust pipes are actually sucking CO_2 out of the atmosphere. all those chemists intellectualists with their "combustion science" are liars in the pay of Big Gore. we're through the looking-glass here, people! Here in Britain all 13 year olds that have attended secondary school (so, basically, all 13 year olds) have been taught that the atmosphere is 78% nitrogen, 21% oxygen and 1% trace gases, so the assertion that most people asked think carbon dioxide is between 20% and 70% would simply imply that you were asking pre-teens. "I submit that most of the rise in atmospheric CO2 is from oceanic outgassing as the earth has warmed from the last Ice Age and the LIA. As the eath warms CO2 rises regardless of any human factor." Can Welch explain why the oceans are acidifying (ie the pH is dropping) if the CO2 is coming OUT of the oceans instead of IN? And can Welsh explain why surface water meaurements show the exact opposite, that is the oceans are acting as a carbon sink. It really does show how ludicrous and hair brained some of the idea's that the Wattie brethren dream up.